IA Zero Robotics Team takes Second in Finals! The finals of the Zero Robotics competition at MIT, went well and IA's team in alliance with two other teams from Romania, (Team A.S.P.) placed 2nd in the virtual finals. 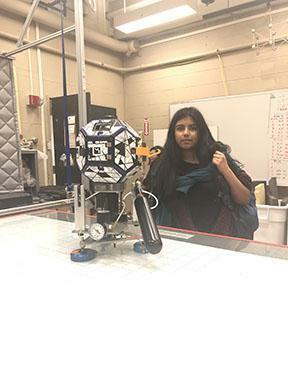 Pictured here is Neha Dwibhashyam with the model of a SPHERE (Synchronized Position Hold Engage and Reorient Experimental Satellites), at the Zero Robotics competition at MIT. These SPHERES were programmed by the high school students and their code was run by the astronauts on the ISS.